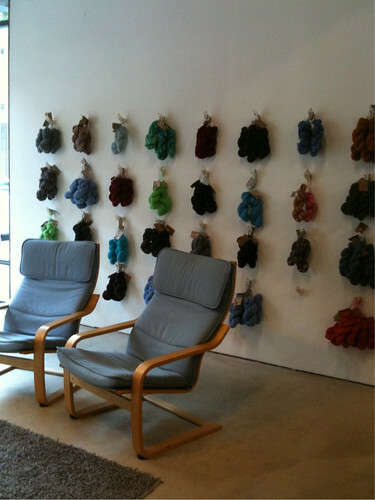 So while in SF, I visited Imagiknit and Urban Knitting Studio. I walked through the door of Imagiknit and if there hadn't been people coming in the door behind me, I would have just stopped and stared with my jaw hanging open. ...this is just part of the first room. There's a whole other second room. And, in all that, they also had every weight of Malabrigo, including Sock and Lace, which I didn't know about, and two skeins of Malabrigo Sock came home with me. Imagiknit has big front windows, so I walked them over into the daylight and that sold me, right there. 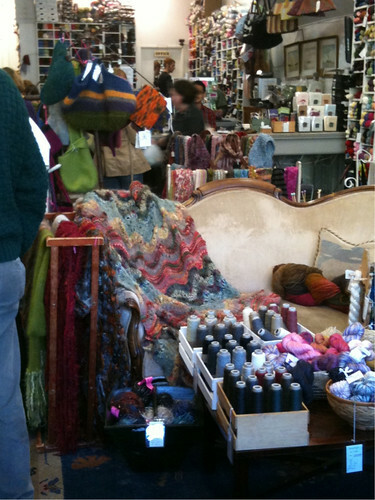 The shop was buzzing with activity, but also had nice comfortable seats for those who wanted to sit and go through pattern books or just sit (it's a lot of yarn to take in all at once). Urban Knitting Studio has a wonderful light, airy feeling, with plenty of space to browse in and comfortable seats in the big glass windows. As you can see, I lucked into a clear-skied, sunny stretch while I was there. Lovely place, stylish, elegant, and friendly! I've got a small set of trip photos up on Flickr (SF November 2009); once I figure out how to get my short video clips uploaded to Flickr I'll add those in too.